Election Day Astrology – What’s Your Take? 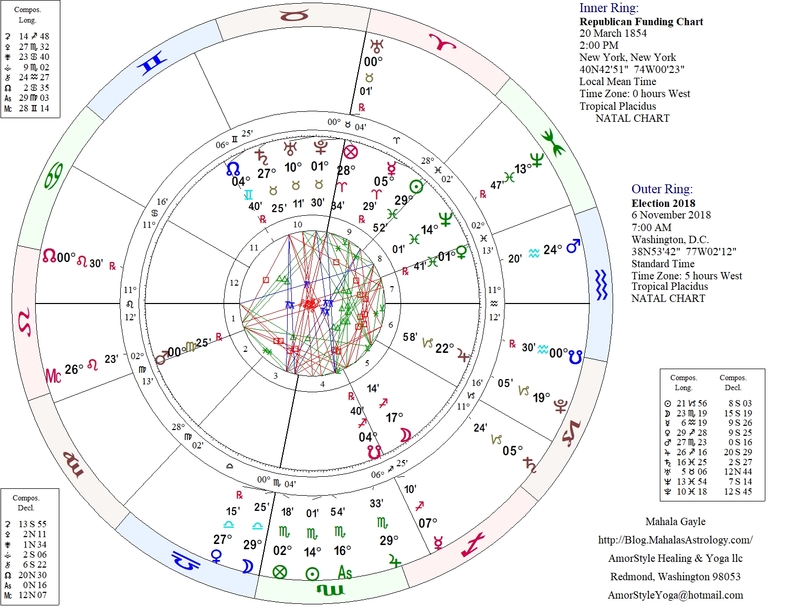 Can astrology help to predict the outcome of an election? Wouldn’t that be cool if it could? This article is all about reviewing the energies of influence on the two major political parties in the US come November. At the end of this article you will find links to all the data files so you can review and interpret the data from your own point of view. 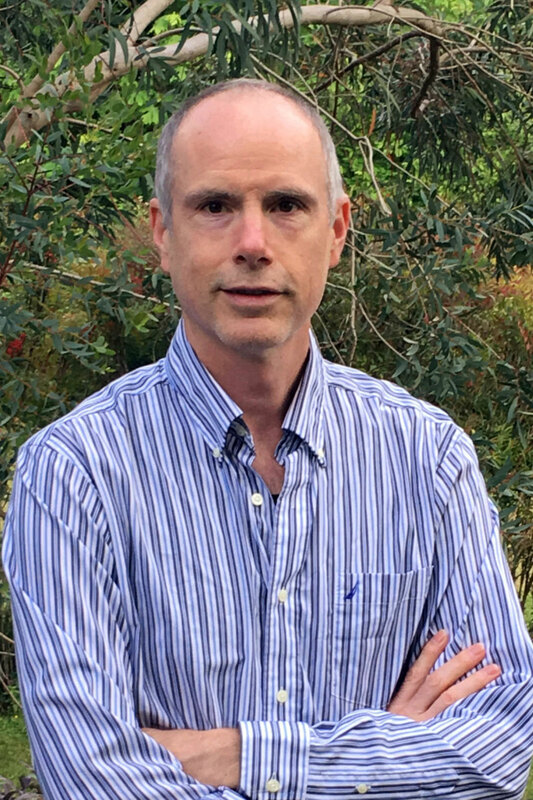 I would love to see your comments or suggestions, particularly – your interpretation of the data. If anyone were to use astrology to predict the outcome of the election, what would they look for? Or maybe I should word it this way, can astrology give us an idea regarding who might win an election? Wait! Before you take my word for it, skip to the reference section at the bottom of this article and go look at the data. If I left out some key data, please let me know so I can include that information in this article too. When you do analyze the data, please share influences that you think are critically important to consider so we can all get a clearer image regarding what’s coming our way this November. The biggest thing that I see as a detriment for the democratic party is that the energies are aligned to force the party to deal with emotional issues which they will not be able to control. The energy is aligned for ‘death like’ experiences and their leadership communication ability is restricted. It’s like they will be in a situation where they will have to plan a funeral, watch their company go under, have their computer break and then they forget their password. The energy doesn’t seem conducive to coming out on top. Now, please, review the details. I wrote about the natal characteristics of the democratic party in a previous post – The Democratic Party Natal Attributes. Please review that post if just for the summary. Likewise, please review The Republican Party Natal Attributes in order to get a feeling for the types of energy that is engrained in that party. Now we want to look ahead at November 6th, 2018. Ultimately, we’re going to want to know where the planets are and how they might affect the two different political parties. Rather than drawing a chart for election day, we’re going to simply create a bi-wheel that shows the transits relative to the natal charts for both parties during the election. This way, we can look for aspects that might be interesting and interpret at what they might mean. Now, do you see any aspects in the biwheel that are worth noting? To me, there are a few aspects worth talking about. Notice the transit Sun is just coming out of a perfect conjunction with Mars and a few days before that, Jupiter. In the natal chart these are harmonious aspects to the identity of the party. Seeing that the Midheaven is also aligned to the ascendant, it would seem that there will be an abundance of fighting energy particularly with regards to emotions that are outside the party’s control. This would be the influence of the 8th house. Also, we know that Saturn plays a key karmic role in this chart and it’s sitting next to the natal Mercury all in the 10th house. Keep in mind that this is the house that shows the traits of the leaders in this organization. Saturn is going to bring the resistance, rules and regulations as it influences how the leadership is able to communicate. I would expect all aspects of communication to be impacted by this aspect. We also know that Pluto plays a key role in the identity of this party. That underworld energy is nearly on top of the natal Sun + Neptune pair all in the 11th house of emotional maturity. This is the house that represents the most mature aspects of the organization. It touches on how it is runs and how the long-term decisions are made. Pluto, in this role, will most likely bring transformation to the leadership and how decisions are made. Note that this is a longer-term transit so some of the effects should have already been felt. This transit might be a little out, but Pluto seems to really have an impact on this party. 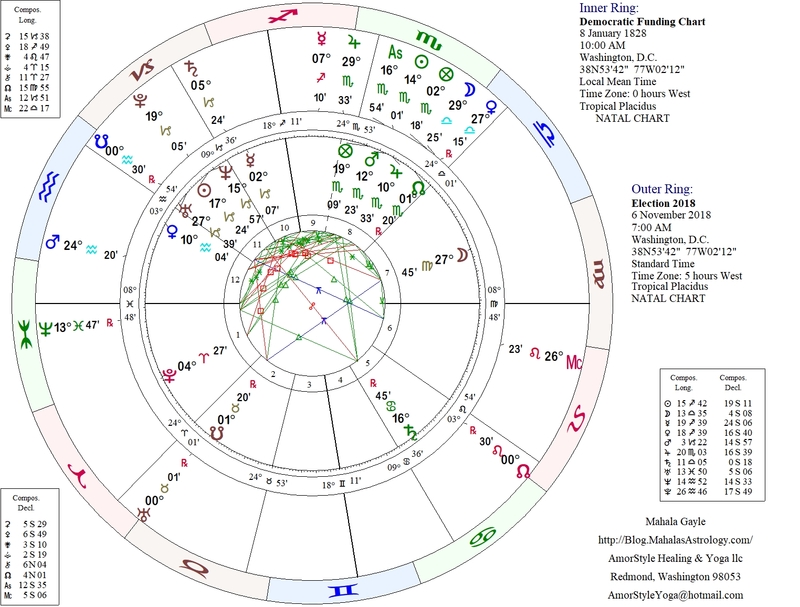 If you roll back the clock to July 24th 2016, you’ll see that Pluto was perfectly conjunct Neptune and nearly perfectly in opposition to Saturn right around the time that news broke that Debbie Wasserman Schultz stepped down from her leadership position in the party which was a time where the party was pledged by scandals and secrets. If you want to look at nearly perfect aspects, I ran the software to give me the exact list of nearly perfect transits-to-natal and this is what it produced. From this collection, it would seem that the transit Saturn will be in a hard aspect with the natal Pluto. If we where to see any transformation, it’s going to be with regards to the identity of the party. The leading days right up to the election has the Sun amplifying the Jupiter and Mars energies in the 8th house. This is the house of death and birth, but more importantly, it’s about having to deal with things that happen to you that are outside your control. They are generally deeply emotional and force you to have to mourn. It’s not a great place to have your key power planet. In the 10th house of leadership, this party has restrictive energy. As seen in the natal chart, the strength of this party is to be able to lead in an emotional way. How they communicate is critically important to how they lead. With Saturn creating resistance here, I would expect that there will be breakdowns in communication or restrictions that hinder how this party gets the message out. What makes this even worse is that Pluto is in the 11th house which deals with the long-term aspects of ruling the organization. That is the house where structures are put in place to make sure the organization functions successfully over generations. Pluto has passed Neptune and still has a little hold on the Sun, which suggests that the transformations to the party have already been taking place. This is not a good sign for the long-term functioning of this group. As I see it, the energy for this organization is more aligned with fighting for its survival and having to defend itself against emotional energies that it has no control over. It’s more of a struggle then a celebration. Let’s do the same thing for the republican chart. When I look at this chart, I want to find aspects that challenge Mars or cause conflicts with any of the planets in the 10th house of leadership. Yet the first thing that stands out is Neptune. We’ve already established that Neptune is a planet with karmic significance for this party. Even though it’s a longer transit, it’s probably going to carry strong undertones that will make this party feel ‘at home’, ‘in sync’, ‘aligned’ allowing the mind to dream and entertain ideas that are not grounded in the physical. The current location of Uranus is in Taurus moving retrograde. It falls back into Aries exactly during the election. It doesn’t come back out of Aries until March of next year. Uranus can signify radical change, upheaval, rebellion, anarchy, independence and unexpected events. Uranus is temporally moving from a grounded feminine sign of Taurus into the fiery masculine sign of Aries. This planet is also playing with the cusp of the Midheaven between the 9th and 10th houses. I would expect that this sign transition will accentuate the differences between male and female and we’ll see this again after it turns direct. Looking forward, Uranus will be coming back to transverse the 10th house and complete its conjunction with Pluto on April 4th, 2019. We might be in for some explosive transformational changes to the leadership of the party come springtime. Pluto is starting to work on transforming the influence of natal Jupiter. Natal Jupiter is in the house that represents the results of your work. It is a karma type situation. If the work is harmful, the results will show in sickness or disharmony. Likewise, if the work is helpful, the results will show a new state of health. The interesting thing about this aspect is that it doesn’t come exact until March 24th 2019. It’s as if this chart is setting up for some significant transformations next spring. When I run the transit-to-natal report, I get the following aspects that are in effect on the 6th of November. This should be a very favorable transit for this party. Uranus will energize, encourage and give confidence to the party. It will feel like they will be able to get a lot done and that they can make forward progress. Even though this is a square, it’s going to kick the Mars energy into action. It will bring that bold, daring willingness to make your next step and break free of limitations. It’s going to open up new opportunities and possibly inspire the party deep down to its core. This transit is really going to empower the imagination. The party will feel very creative and will spend time enjoying the figments of their imagination. There is a lot of activity unfolding for this party on election day. The energies seem to embolden and give courage to what they are doing. The ruling energy seems to be exalted and unopposed. And, if you follow the Part of Fortune, you’ll see that Uranus, the planet that rules technology and unexpected changes is nearly perfectly conjunct. It would seem that their good lucky is energized. This is a collection of data and interpretation files that were used. Sun 04° Taurus 06' 05"
Moon 07° Capricorn 51' 32"
Mercury 09° Aries 51' 10"
Venus 04° Aries 43' 39"
Mars 15° Gemini 59' 43"
Saturn 20° Capricorn 29' 39"
Uranus 02° Taurus 37' 15"
Neptune 17° Pisces 50' 55"
Chiron 03° Aries 42' 58"